John Villiers Farrow, KGCHS (10 February 1904 – 27 January 1963) was an Australian-American film director, producer and screenwriter. In 1957, he won the Academy Award for Best Writing/Best Screenplay for Around the World in Eighty Days and in 1942 he was nominated as Best Director for Wake Island. 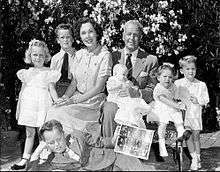 He had seven children by his wife, actress Maureen O'Sullivan, including actress Mia Farrow. Farrow was born in Sydney, Australia, the son of Lucy Villiers (née Savage; 1881-1907), a dressmaker, and Joseph Farrow (1880-1925), a tailor's trimmer. His mother died when he was three years old. His parents were both of English descent. Farrow was educated at Newtown Public School and Fort Street Boys' High School and then started a career in accountancy. He claimed to have run away to sea in an American barquentine, sailed "all over the Pacific", and fought in revolts in Nicaragua and Mexico. Reaching the United States, he enrolled at the Jesuits' St Ignatius College in San Francisco in 1923, but left after one month. He traveled throughout the Pacific, including Fiji, Hawaii and Guam. On arrival in Hollywood, Farrow fabricated his education, saying he had attended Newington College in Sydney, Australia (he lived in a street below its ovals), Winchester College in England and the US Naval Academy. Many publications and websites still contain this information. Farrow started writing while working as a sailor and became interested in screenwriting after a chance voyage in the South Seas with the film-maker Robert J. Flaherty. Re-entering the United States, allegedly by jumping ship at San Francisco, he found his way to Hollywood where from 1927 his nautical expertise brought him work as a script consultant and technical adviser. He had already earned minor recognition as a poet and writer of short stories. He soon established himself as a notable screenwriter. He worked for DeMille Productions, Paramount Pictures and RKO Radio Pictures Inc. He compiled an English-French-Tahitian dictionary and wrote a novel, Laughter Ends (1933), In 1932 he went to England where he worked as a writer and assistant director on G. W. Pabst's film of Don Quixote, and briefly visited Tahiti again. Farrow returned to Hollywood and re-established himself as a screenwriter. On 27 January 1933, while dancing at the Cocoanut Grove nightclub, he was arrested for breach of his visa, as part of a general crackdown against illegal immigrants in the film industry. Farrow was charged with making a false statement while entering the US, having claimed he was Romanian. Although threatened with deportation, eventually he was given five years probation, before being acquitted of the charges the following year. Farrow received a plum appointment to work on Tarzan Escapes (1936) but the film was subsequently rewritten and reshot. In 1930, it was announced that Farrow would direct his own story First Love but this did not materialize. He signed to Warner Bros in 1936 looking to direct and was linked with a number of projects, including a foreign legion story and an adaptation of The Pit and the Pendulum. Farrow finally made his directorial debut in 1937 with Men in Exile. Following this, he accompanied his wife to Europe, where she was making A Yank at Oxford (1938), lecturing on Father Damien, about whom Farrow had written a book, and receiving a Papal knighthood. On his return to Hollywood, Farrow resumed working as a director for Warners. He made several movies with Kay Francis and discovered a young Peggy Ann Garner. Farrow left his contract for a number of months, ostensibly to finish a book he was writing on the history of the papacy, and also due to disputes over the script of Kay Francis's Women in the Wind. However he soon re-emerged as a contract director for RKO. While there he made a number of highly successful B movies, notably The Saint Strikes Back (1939) and Five Came Back (1939). "I deliberately set out to become the damndest commercial director in the business," he said later. "The only way to get anywhere in hospital is to make money pictures. Then you can get some measure of respect and authority from the studio bosses, and little by little you get to do more of the things you want to do." Despite his flourishing career and recently having become a father for the first time, Farrow was keen to be involved in World War II. He went to Vancouver in November 1939 and enlisted in the Canadian Navy. Farrow was appointed lieutenant in March 1940 and assigned to Naval History and the Controller of Information Unit. He worked on anti-submarine patrols and in April 1941 was loaned to the Royal Navy and appointed to HMS Goshawk naval base in Trinidad, and served as assistant to the Senior British Naval Officer, Curaçao. He contracted typhus fever and returned to Naval Headquarters, Ottawa, in late 1941. It was announced he would direct a Canadian war film starring his wife Maureen O'Sullivan while on leave, but this did not eventuate. Farrow was invalided out of the Canadian Navy with typhus in January 1942 at the rank of Commander but remained in the naval reserve. In July 1943 he served as technical consultant for the proposed Royal Canadian Navy show. In May 1945 he was briefly recalled to active duty, travelling to Britain for work in connection with the Director of Special Services. Farrow resumed his directing career with Paramount for whom he made Wake Island (1942), which earned him an Oscar nomination. The success of this saw him make a series of war pictures including China. He signed a long term contract with Paramount in February 1943 and went on to become one of the leading filmmakers for the studio, working several times with Alan Ladd. Farrow's films became less distinguished towards the end of the 1950s. He received an offer from Samuel Bronston to make two films, a biography of John Paul Jones and a story of the life of Jesus Christ, which Farrow had been trying to make for years. He made the first one - John Paul Jones - and was replaced as director on the second by Nicholas Ray – King of Kings (1961). In 1934 he became engaged to actress Maureen O'Sullivan and they married on 12 September 1936. Farrow and O'Sullivan had seven children: four daughters, who became actresses, Mia (born 1945), Prudence (born 1948), Stephanie (born 1949), Tisa (born 1951); and three sons, Michael Damien (1939–1958), Patrick Joseph (1942–2009), and John Charles (born 1946). Maureen O'Sullivan was his second wife, after he converted to Catholicism and received an annulment of his first marriage. Farrow died from a heart attack in Beverly Hills, California at the age of 58 and was buried in the Holy Cross Cemetery, Culver City. As one of the few high-profile Australians in Hollywood during the 1930s, Farrow's activities were well covered by the Australian media. He accepted the Oscar won by the Australian documentary Kokoda Front Line! (1943), met Australian Senator Richard Keane, the Minister for Trade and Customs, when he visited Hollywood during the war and offered to assist in the establishment of an Australian information service in the US. He also often expressed a desire to make a film back in Australia and later made two films with Australian connections, Botany Bay (1953) and The Sea Chase (1955), despite having ceased to be an Australian citizen in 1947. In 1927 he was described as an Australian member of Hollywood, along with May Robson, the New Zealander Rupert Julian, Franklin Pangborn, Josephine Norman and E.O. Gurney. ↑ "Mia Farrow's Interactive Family Tree". PBS. 9 March 2016. Retrieved 2016-06-16. ↑ Hazlehurst, Cameron (2006). "Farrow, John Villiers (1904–1963)". Australian Dictionary of Biography. Retrieved 15 October 2010. 1 2 John Farrow: "Commander Hollywood", CFB Esquimalt Naval & Military Museum Archived 8 February 2012 at the Wayback Machine. ↑ Profile, Tcm.com; retrieved 3 May 2014. ↑ "MOTION PICTURE STARS". Portland Guardian. Vic. : National Library of Australia. 20 September 1928. p. 5 Edition: EVENING. Retrieved 3 March 2012. ↑ "Letter from London.". The Advertiser. Adelaide: National Library of Australia. 17 December 1932. p. 9. Retrieved 3 March 2012. ↑ "AUSTRALIAN ARRESTED IN FILM RAID.". The Mail. Adelaide: National Library of Australia. 28 January 1933. p. 1. Retrieved 3 March 2012. ↑ "GENERAL CABLE NEWS.". The Sydney Morning Herald. National Library of Australia. 10 February 1933. p. 10. Retrieved 3 March 2012. ↑ "U.S.A. IMMIGRATION.". The Mercury. Hobart, Tas. : National Library of Australia. 29 March 1933. p. 8. Retrieved 3 March 2012. ↑ "U.S.A. IMMIGRATION.". The Mercury. Hobart, Tas. : National Library of Australia. 11 January 1934. p. 8. Retrieved 3 March 2012. ↑ "PICTURES and PERSONALITIES.". The Mercury. Hobart, Tas. : National Library of Australia. 5 December 1936. p. 5. Retrieved 3 March 2012. ↑ "AROUND THE FILM EXCHANGES". The Mirror. Perth: National Library of Australia. 27 December 1930. p. 6. Retrieved 3 March 2012. ↑ "Hollywood Roundabout". The Advertiser. Adelaide: National Library of Australia. 8 May 1937. p. 13. Retrieved 3 March 2012. ↑ "Studio Gossip". The Mail. Adelaide: National Library of Australia. 30 October 1937. p. 2 Supplement: Ginger Meggs. Retrieved 3 March 2012. ↑ "A talented twelve-year-old". The Australian Women's Weekly. National Library of Australia. 30 September 1944. p. 10 Section: Movie World. Retrieved 3 March 2012. ↑ SCREEN NEWS HERE AND IN HOLLYWOOD: Edward Small Plans to Make 'The Maginot Line'--Louis Hayward Will Be Star IF I WERE KING' TO OPEN Premiere at Paramount Today to Feature Ronald Colman and Basil Rathbone Jack London Story for Screen Of Local Origin Special to THE NEW YORK TIMES.. New York Times (1923-Current file) 28 Sep 1938: 29. ↑ "FILM FOLK and Talkie Shots". The Mail. Adelaide: National Library of Australia. 4 February 1939. p. 2 Supplement: Talkie news. Retrieved 3 March 2012. ↑ "War News In Brief.". The Advertiser. Adelaide: National Library of Australia. 8 November 1939. p. 20. Retrieved 3 March 2012. ↑ "GENERAL CABLE NEWS.". The Sydney Morning Herald. National Library of Australia. 22 March 1940. p. 8. Retrieved 3 March 2012. ↑ "Hollywood has its patriots...". The Australian Women's Weekly. National Library of Australia. 5 October 1940. p. 21 Section: The Movie World. Retrieved 3 March 2012. ↑ "FILMS YOU'LL BE SEEING SOON.". The Mail. Adelaide: National Library of Australia. 29 May 1943. p. 12. Retrieved 3 March 2012. ↑ "Hollywood's New Romantic Team.". Sunday Times. Perth: National Library of Australia. 6 May 1945. p. 4 Section: The Sunday Times COMICS. Retrieved 3 March 2012. ↑ "Town Called Hollywood" Scheuer, Philip K. Los Angeles Times (1923-Current File) 08 Nov 1942: C3. ↑ DRAMA: 'Outlaw' Stars to Tour; 'Army' Eligibles Named Schallert, Edwin. Los Angeles Times (1923-Current File) [Los Angeles, Calif] 06 Feb 1943: A7. ↑ "JOHN FARROW NOW U.S. CITIZEN.". The Sydney Morning Herald. National Library of Australia. 14 July 1947. p. 3. Retrieved 3 March 2012. ↑ "Secret Marriage Denial.". The Barrier Miner. Broken Hill, NSW: National Library of Australia. 25 October 1932. p. 1. Retrieved 3 March 2012. ↑ "SCREEN SHORTS.". Western Mail. Perth: National Library of Australia. 27 November 1930. p. 4. Retrieved 3 March 2012. ↑ "AUSTRALIAN SCENARIO WRITER.". The Sydney Morning Herald. National Library of Australia. 27 September 1934. p. 11 Supplement: Women's Supplement. Retrieved 3 March 2012. ↑ "California Births 1905–1995". Familytreelegends.com. Retrieved 2016-06-16. ↑ "GENERAL CABLE NEWS.". The Sydney Morning Herald. National Library of Australia. 7 September 1936. p. 12. Retrieved 3 March 2012. ↑ "£3 A Week Waitress To Star?". The Sunday Herald. Sydney: National Library of Australia. 4 February 1951. p. 4 Supplement: Sunday Herald Features. Retrieved 3 March 2012. ↑ "Flag dipped to honor film servicemen.". The Australian Women's Weekly. National Library of Australia. 20 March 1943. p. 19. Retrieved 3 March 2012. ↑ "MINISTER'S U.S.A. VISIT EMPHASISED AUSTRALIA'S LACK OF REPRESENTATION.". Townsville Daily Bulletin. Qld. : National Library of Australia. 22 January 1945. p. 2. Retrieved 3 March 2012. ↑ "Australia Blows Hard On its Publicity Tin Trumpet.". The Mail. Adelaide: National Library of Australia. 7 April 1945. p. 4. Retrieved 3 March 2012. ↑ "Kennedys Home From Hollywood.". The Argus. Melbourne: National Library of Australia. 8 August 1944. p. 8. Retrieved 3 March 2012. ↑ "BRAINS ENHANCES HER PULCHRITUDE: BEAUTIFUL AUSTRALIAN GIRL ARRIVES Antipodean Prize Winner Comes to Woo Fame as Picture Actress" Los Angeles Times (1923-Current File) 14 June 1927: A8. ↑ "The World of Pictures.". The Brisbane Courier. National Library of Australia. 1 September 1928. p. 23. Retrieved 3 March 2012. ↑ "AMUSEMENTS.". The Examiner. Launceston, Tas. : National Library of Australia. 12 April 1929. p. 5 Edition: DAILY. Retrieved 3 March 2012. ↑ "AMUSEMENTS.". The Mercury. Hobart, Tas. : National Library of Australia. 24 January 1929. p. 5. Retrieved 3 March 2012. ↑ "AMUSEMENTS.". Townsville Daily Bulletin. Qld. : National Library of Australia. 19 January 1929. p. 3. Retrieved 3 March 2012. ↑ "SNIPING THE SHOWS.". Sunday Times. Perth: National Library of Australia. 10 March 1929. p. 8 Section: First Section. Retrieved 3 March 2012. ↑ "Aimee McPherson Would Convert World By Talkies: Movie News.". The Register News-Pictorial. Adelaide: National Library of Australia. 19 April 1930. p. 8. Retrieved 3 March 2012. ↑ "SOUTH TOWNSVILLE TALKIES.". Townsville Daily Bulletin. Qld. : National Library of Australia. 30 June 1932. p. 3. Retrieved 3 March 2012. ↑ "PICTURE THEATRES.". The Mercury. Hobart, Tas. : National Library of Australia. 4 April 1932. p. 5. Retrieved 3 March 2012. ↑ "LONDON NOTES.". The West Australian. Perth: National Library of Australia. 16 September 1932. p. 2. Retrieved 3 March 2012. ↑ "PERIL ON THE HIGH SEAS.". Western Mail. Perth: National Library of Australia. 20 September 1934. p. 39. Retrieved 3 March 2012. ↑ "FILM REVIEWS.". The Sydney Morning Herald. National Library of Australia. 31 May 1937. p. 5. Retrieved 3 March 2012. ↑ "Australian Directors At Work.". The Mail. Adelaide: National Library of Australia. 6 August 1938. p. 2 Supplement: Talkie News. Retrieved 3 March 2012. ↑ "FILM REVIEWS.". The Sydney Morning Herald. National Library of Australia. 20 November 1939. p. 3. Retrieved 3 March 2012. ↑ "THE NEW HITLER FILM.". The Sydney Morning Herald. National Library of Australia. 14 August 1943. p. 7. Retrieved 3 March 2012. ↑ LEAD IN FOX FILM TO LINDA DARNELL: Actress Is Named by Studio to Role in 'The Guy Who Sank the Navy,' Football Story Marton to Direct "Pedley" By THOMAS F. BRADY Special to THE NEW YORK TIMES.. New York Times (1923-Current file) [New York, N.Y] 26 Oct 1950: 38. ↑ "'Damien the Leper' Purchased by RKO; Robert Sisk to Be the Producer — Joseph Calleia Has Been Assigned to Title Role". The New York Times. May 17, 1939. Retrieved 2015-11-27. ↑ "Hollywood Buys 45 More Stories to Add to 1940 Feature Programs". Motion Picture Herald. 136 (1): 34. July 1, 1939. Retrieved 2015-11-27. ↑ "PAGEANT OF THE POPES", by John Farrow. Sheed & Ward. 394 pp. $4.50. The Washington Post (1923-1954) [Washington, D.C] 12 Mar 1950: B6.